Want to Save an Heirloom? Grow it! 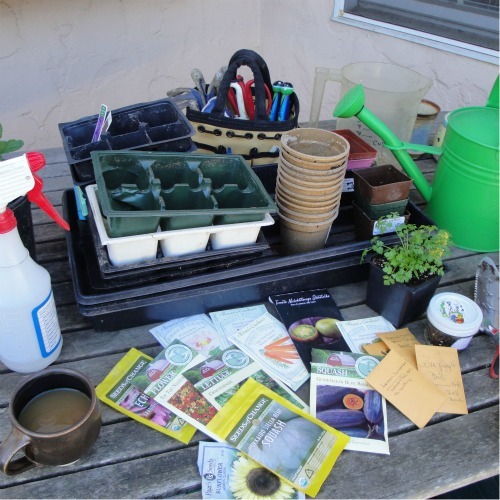 I’m getting ready to sow my Three Heart Lettuce seeds and be part of a volunteer team that is evaluating a special heirloom variety of lettuce that is in danger of extinction. Just like rare wild plants and animals, food crops can disappear forever. It happens when people are no longer growing them, and it’s happening more often now that we rely on industrial agriculture for the produce we eat. The project is the Member-GrowerEvaluation Network (M-GEN), run by Seed Savers Exchange (SSE). 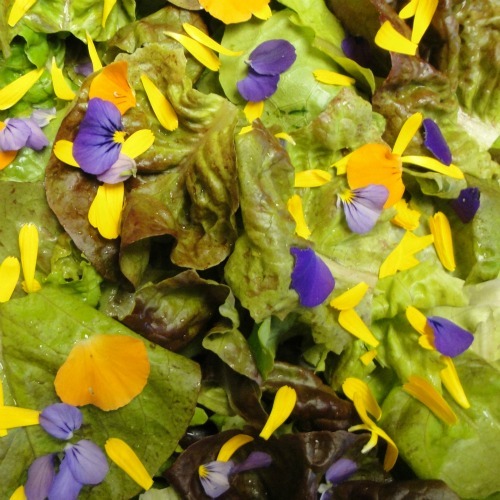 The program was initiated last year to involve Seed Savers Exchange members in evaluating the numerous heritage varieties of edible plants maintained at their headquarters, Heritage Farm, in Decorah Iowa. Seeds that are donated to the organization often don’t come with growing instructions or information about where the seeds grow best for good performance. SSE’s extensive network of member are located in growing regions all across North America, so it makes sense to harness this valuable resource. In this way, they are gathering data on the regional suitability of many varieties in their collection that lack this information. These details will make the seeds usable to gardeners and farmers, therefore it's more likely they will be maintained in cultivation. Why is this important? People are beginning to realize that diversity in food crops means food security, especially in a time of climate change and shrinking crop diversity in agriculture. 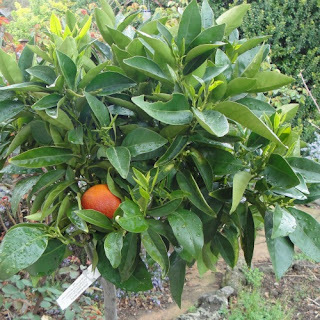 The less varieties of any one type of food plant we have, whether it be corn or lettuce, the less flexibility and options we’ll have when one of them falls victim to diseases, pests, or a changing climate. Saving seeds and cultivating as many heritage food plants as possible provides a measure of “agrobiodiversity” to tap into when needed. This crowd sourcing strategy has been used successfully by the Audubon Society in their annual Christmas Bird Count, which leverages the expertise and energy of thousands of volunteers every year. These expert and amateur bird enthusiasts have been gathering valuable data on bird populations, for over 100 years. It would be difficult indeed for a non-profit organization to fund such an enormous effort. The information collected in the M-GEN project will benefit all SSE members and the public in general, by providing data on the performance of particular varieties for particular regions (anyone can order seeds from SSE). This is very helpful for gardeners choosing which vegetables to plant, and gives them an idea of what to expect in terms of performance for their region. Seed Savers Exchange was founded in 1975, and is made up of home gardeners and farmers that grow, harvest and exchange seeds for thousands of varieties of edible plants, including herbs and flowers. An updated yearbook is published at the beginning every year with information about seeds that are available directly from members for a small fee. In addition, SSE maintains a catalog of seeds and you can order directly from them. You don't have to be a member to order seeds from SSE's catalog, but you do have to be a member to order from the yearbook. What do you expect from food that is labeled organic? Pesticide free? Responsible stewardship of the land? The certified organic label may not meet your expectations. 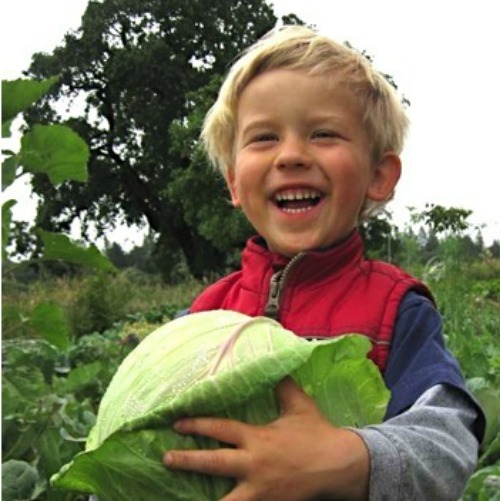 Paul Kaiser, of Singing Frogs Farm in Sebastopol, California, explains why. I met Kaiser, or Farmer Paul, as he is known locally, at the 2012 EcoFarm Conference where we talked about saving bees, creating earth-friendly farms, and the misuse of the terms organically grown and sustainable agriculture. He pointed me to an essay he wrote on the subject and gave me permission to share some of his thoughts from that piece. So you’ve started your seeds indoors to get a jump on spring, and like magic they are beginning to grow. Now you’ve got seedlings. 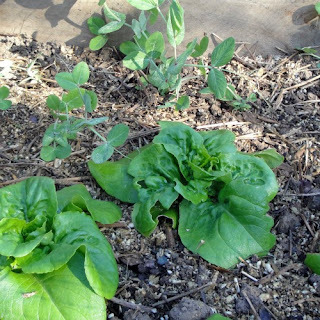 The excitement of having grown your own starts for your vegetable garden can turn into panic if it is still too cold to plant them in the garden. 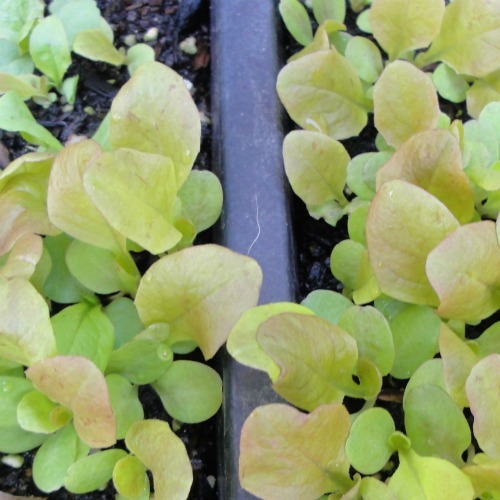 Here are my tips and "how tos" for managing seedlings for your edible landscape. Once the seeds start to grow they'll need either direct sunlight, or exposure to lights indoors. Your options are to hang lights over the seedlings if they’re indoors (12 hours daily), or to move them outside into a cold frame in the sun. The cold frame works well if outside temperatures are at least 40° F. If nighttime temperatures are too cold, bring them back inside for the night. are all cool season veggies and have some degree of resistance to frost and prefer cool temperatures. Enjoy nurturing your seedlings and watching them grow. You'll have the pleasure of starting your edible garden with the vegetable varieties you really want instead of having to grow whatever is available. But best of all, you'll have the satisfaction of knowing you can grow your own food from start to finish. 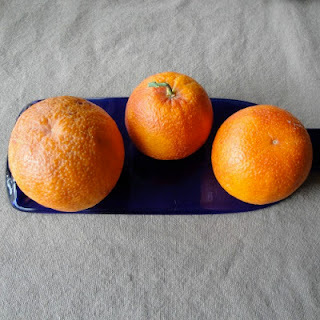 We have been feasting daily on beautiful blood oranges from our local farmer’s market for weeks now, but our vendor has just ended his season. What to do? We love them so much that I bought a tree to add to our suburban mini-orchard. The amazing raspberry-ruby grapefruit flavor of blood oranges is a special treat, but you have to take advantage of their short seasonal availability. That may change soon. 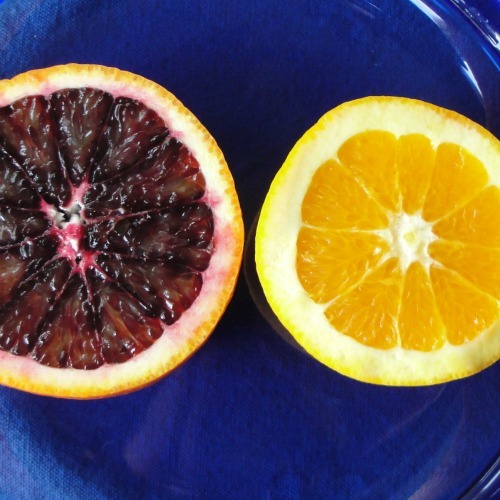 Just as I brought home my small Moro blood orange tree, I found out that researchers have identified the gene responsible for the color and health benefits, and they are trying to develop a new, more widely accessible variety. I'm feeling particularly fortunate to live in the SF Bay Area where our climate meets the unique requirements of the blood orange. It turns out to have a need for exposure to cold temperatures (chill hours) in order to develop its beautiful color, which contains all of the health benefits associated with anthocyanins. It's almost mid March and my Jerusalem Artichoke patch still had lots of tubers left to harvest. Over fall and winter we made lots of creamy vegetable soups, ate them sliced and sauteed with mushrooms, and added them raw and sliced thinly to salads. 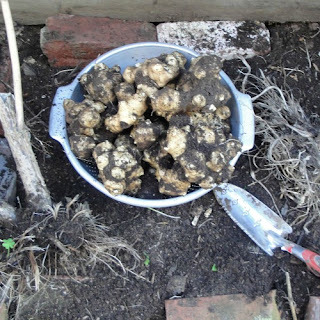 I harvested the last of them this weekend so that I could replant the patch anew with just a few tubers. 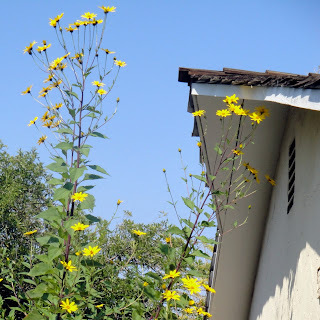 They are so prolific that it's a good idea to dig all of them up and replant only three to four to have a huge crop for next fall and winter- otherwise they will quickly spread in the ground and become invasive. 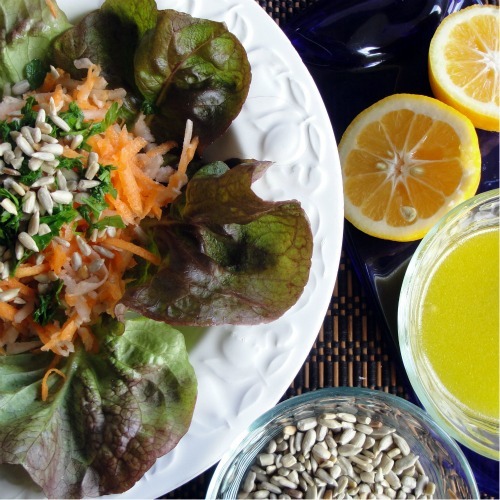 You can substitute regular lemon juice, but you'll have to use less juice or add more olive oil, since Meyer lemons are sweeter and less acidic than regular lemons. 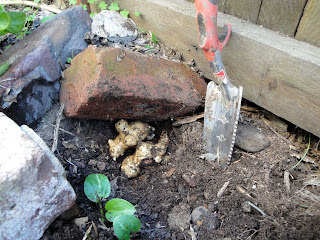 Jerusalem artichokes, or sunchokes, are easy to grow and don't need a lot of extra care. Plant in the spring and harvest in the fall when they begin to die back with the first frosts. They grow vigorously and produce an abundance of tubers. Some people call this invasive, I call it free food. See below for my tips on how to manage your crop so it doesn't get out of hand. 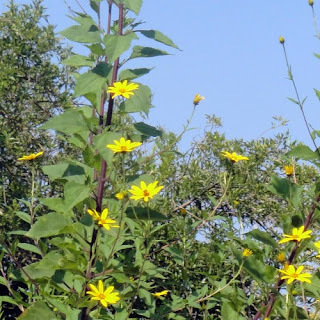 Jerusalem artichokes, Helianthus tuberosus, are native to North America and belong to the sunflower family. 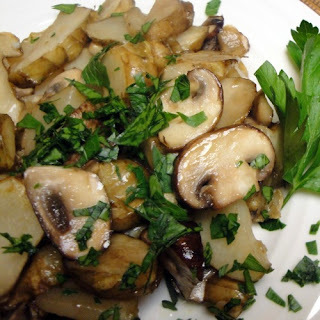 They aren't related to artichokes and didn't originate in Jerusalem, but their edible tubers do have a slight artichokey flavor. They make delicious soups, slice to saute them with mushrooms, or have them raw in salads. For recipes my see recipe index. Sunchokes become available in the fall. Check your farmer's market or grocery store for tubers in the fall and winter months and save a few to plant in the spring. I stored about four tubers in a pot on my porch in potting soil over the winter protected from frost. I planted a couple of the tubers in the spring on the sunny side of our house where we had sheet composted to build up the soil over the previous winter. They need a sunny spot, regular water and medium quality garden soil. In spring, plant a few tubers about 2 inches deep and about eight inches apart in loose soil in a sunny spot after all danger of frost is past. Adding mature compost to the soil is a plus. Start with a modest sized patch, mine is about 1 1/5 feet by 2 feet. We got several pounds from a patch this size! Water well. Keep the soil slightly damp and they will begin to sprout. As they grow, water when the soil begins to dry out. They don't need to stay moist and can dry in between watering. They will grow straight up and may need to be staked. Sprays of multi-branched yellow flowers bloom in August or September. 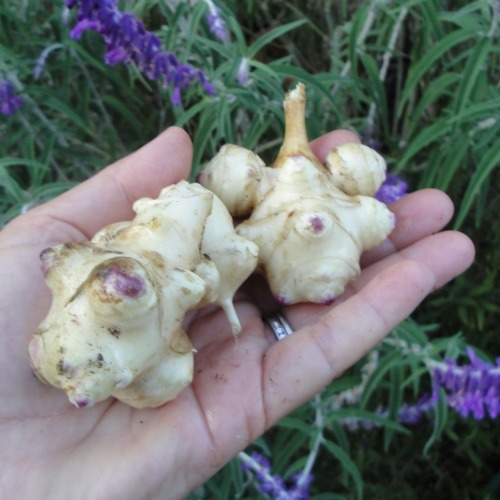 Jerusalem artichokes are frost tender, so they will begin to die back when the frosts begin. When they die back cut the stalks to about 1 foot in height. The tubers become sweeter after exposure to cold temperatures, but you can begin to dig them up and try them right away. Keep them in the ground and dig them up as you need them. If the ground freezes in your region, mulch the tubers well with straw. To dig them up use your hands or carefully dig with a trowel so that you don't break them up. The broken ones will rot in the ground. 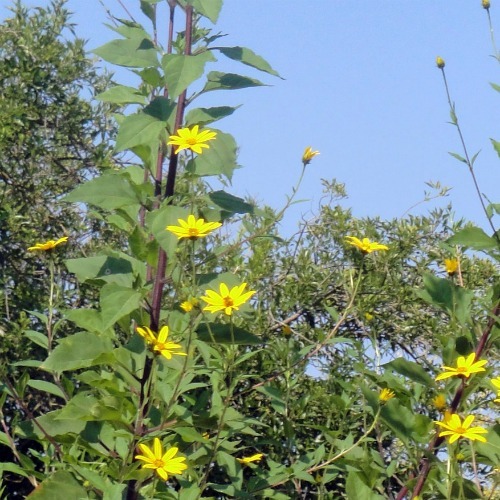 Jerusalem artichokes can become invasive if you don't manage your planting area. As spring approaches dig up all of the tubers that you can find. Replant only a few, depending on the size of the crop you want the next fall. In this way you'll keep them under control, otherwise they will spread rapidly and form big mats of tubers! My growing area is bordered by bricks to help define the patch. This makes it easier to find them when I want to dig them up. 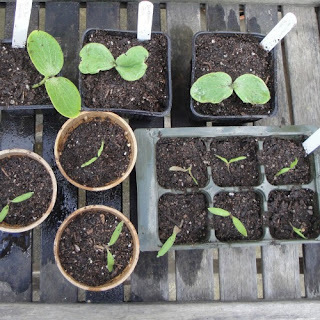 There are a couple of practical reasons for sowing seeds in flats or pots before putting them directly in the ground: you can start them earlier indoors so that they have a head-start by the time it’s warm enough that they can be planted outdoors (tomatoes, squash, cucumber- the summer heat loving vegetables) and better survivability. When I sow seeds directly in the garden they have a bigger chance of drying out or getting munched on by critters. If you are new to growing from seed, I recommend starting with two or three vegetables or flowers to get a feel for it so you aren’t overwhelmed. Once the seeds begin to germinate you can’t forget about them- if they dry out they’ll die, and you’ll need to start over. Most seeds take about 7 to 10 days to germinate, and some take longer. It helps if they are indoors where you’ll be reminded to check them. As the season warms up you can keep your newly sown flats or pots outdoors. Potting soil (you can mix your own, but I found it’s easier to buy a big bag, premixed). Labels, pencil, pen, or marker. 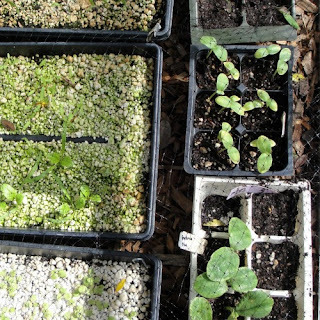 Flats or small pots, reused six-packs from buying seedlings (or other containers, such as waxed paper cups- but these need drainage holes). Bucket or plastic container for mixing soil with water. Seeds (there are several reputable organic suppliers ). 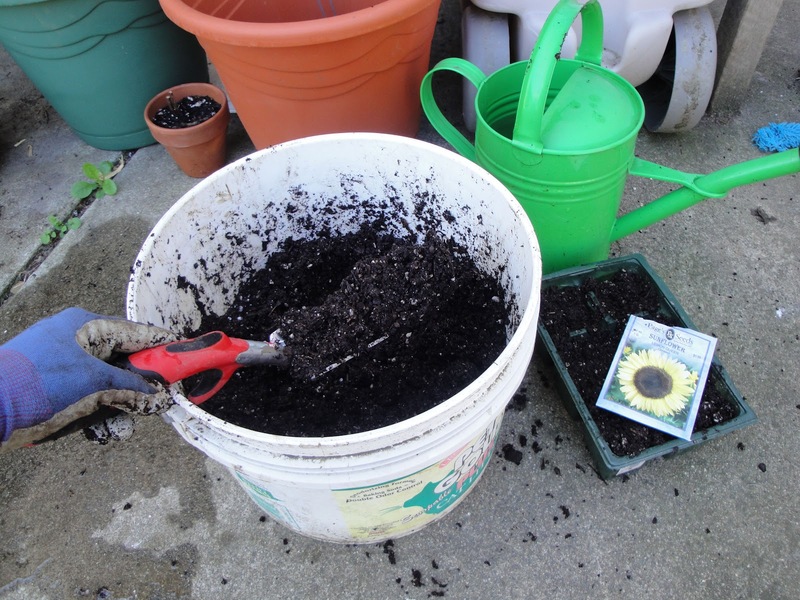 Tip: I use a bucket to mix the potting soil with water to just get it damp before filling the potting containers. It’s much easier to start with damp soil than to try and water it thoroughly once you’ve planted your seeds- trust me! 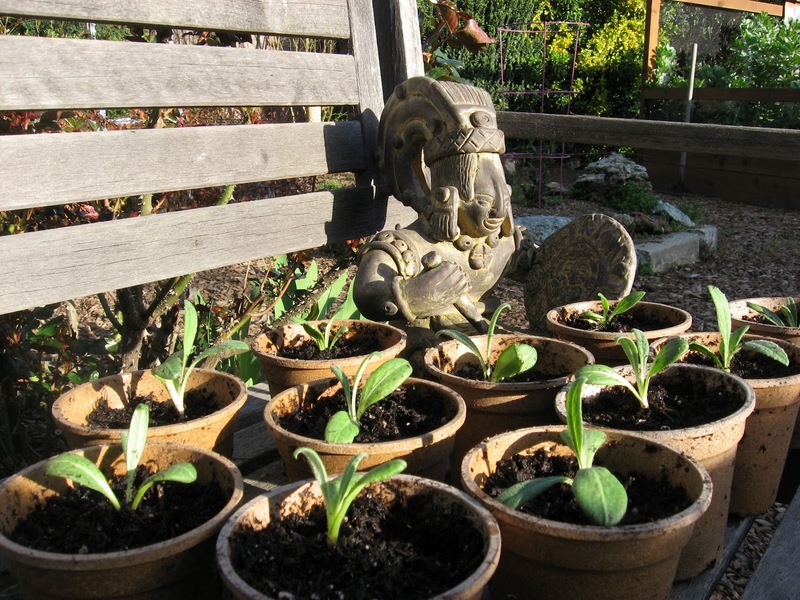 Fill the containers and lightly firm the soil (soil should be about ½ inch from the top of the container). 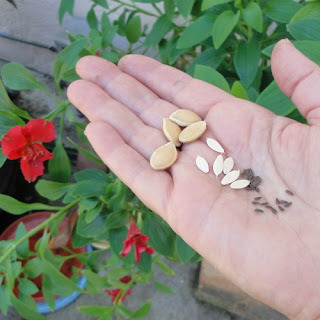 As you would guess, the sizes of seeds vary enormously from tiny lettuce or poppy seeds, to squash and bean seeds. Follow the instructions on the seed packet for the best chance of success. How deep to plant? For most seeds, plant as deep as the seed is wide (the width of the seed, not the length). So if a squash seed is ½ inch wide, it should be covered with ½ inch of soil. It is better to plant too shallow than too deep. When the seed germinates (sprouts) the embryo has just enough stored food to start poking out of the surface of the soil, and begin developing the leaves for photosynthesis, which will take over for food production. If it’s buried too deep it won’t make it to the surface. This is also why seeds don’t need fertilizer until they begin developing leaves. For tiny seeds such as lettuce, sprinkle the seeds on the surface (a flat is great for this) then cover with a sprinkle of soil. Spray the surface down with a water in a spray bottle. Next, I cover the flat with one layer of newspaper, perlite, or a fabric called a floating row cover. 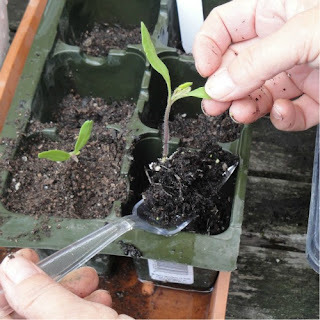 The idea is to keep the soil moist but to let light in until the seeds sprout, then remove the cover. Set the containers near a sunny window indoors in a warm spot. Don't forget to label them. Once the seeds start to grow they'll need 4 to 6 hours of light daily. 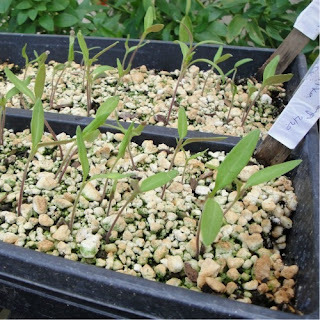 For strong seedlings move them outdoors if the temperature permits (after your last expected frost date). Alternatives are to move them into a cold frame, or keep them inside under grow lights, available from your nursery or garden supply center. Otherwise you'll have spindly weak seedlings. For most seedlings, wait until the second pair of leaves form. 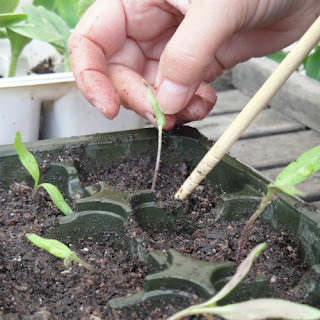 If your seedlings are in a flat, transplant them to six packs or small pots to give them a chance to develop a healthy root system before planting out in the garden. When they're ready to move outside, keep them in a protected area (a covered porch, etc.) for a few days so that they can adjust to outside temperatures before planting in the garden. 1. Once the seeds are wet, don’t let them dry out- this is critical. 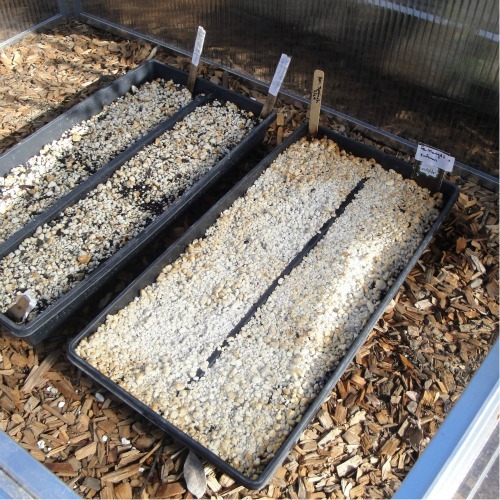 Aim for even moisture when the seeds are germinating and have sprouted, but don’t let them sit soggy or they may rot (need adequate drainage). 2. Feeding the seedlings: fertilizer is not necessary until the leaves begin to grow. If you are going to transfer the seedling to a larger pot for more growth, you’ll need to give it nutrients. For liquid fertilizer: use an organic dry fertilizer mix, such as, Dr. Earth, soak overnight in water (read the label- some are about 1 cup dry fertilizer to a gallon of water). You can also use a cup of mature compost from your compost pile to make a compost tea- this should soak about fours days before you use it. It won’t be as nutrient-rich as the fertilizer mix, but it’s good for the seedlings in a pinch. Now for the hard part: choosing just a few to grow from hundreds of possibilities! Got a favorite heirloom to grow? I'd love to know, really.